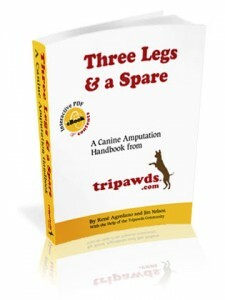 The new downloadable Tripawds e-book, “Three Legs & A Spare,” is getting pawsitive feedback from new Tripawds pawrents. “Three Legs & A Spare” is a collection of our best information about canine amputation and life on three legs, from the last four years of Tripawds.com. 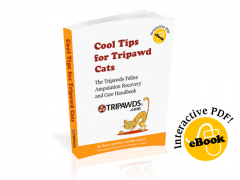 We recommend it for pawrents who are about to go through the amputation experience, or those who just did, and don’t have time to search through our Discussion Forums or pour through our Required Reading List. Read more about this comprehensive e-book here. 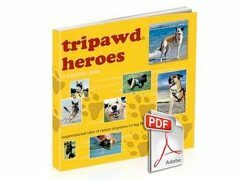 And if you decide to purchase it, we’d love to hear your feedback and suggestions, so please feel free to share your thoughts here in the Tripawds Discussion Forums. Our 3yr old Weimer (Maudie) is in surgery at this very moment,having been struck by a schoolbus.She’s losing her left front leg. We are desperate for any help. My wife is downloading the book and we are looking forward to any help it will provide. Stu, we can’t thank you enough. However we can help, please let us know. We are always in the Discussion Forums, where so many others can help too. Good luck with Maudie, we’re betting your girl will do just fine. She has age and size on her side for sure. Keep us posted OK?